Channa Masala always reminds me of lazy Sundays and even more relaxed day that follows. There was a time when on waking you can actually sit out and enjoy the serene early morning, with cool breeze touching your cheeks and you fill you don’t want anything else at that moment. Life is perfect and it gets even more perfect when you are treated to a delicious breakfast of Pooris/ Baturas with channa. Followed by a viewing of good old hindi songs in rangoli on the national dd. Then a relaxed loitering around the house, while everybody is busy with their own things, nobody bothering you much on anything. Followed either by a feast from Amma or a lunch out and then a wonderful siesta that keeps you under duress till late evening. Lapping on Chaaru, followed by a stroll under moonlit nights that makes you want to curl again. Life indeed was straight out of a book. Of course, the butterflies that run around in rocket speed, the moment you get back home and remember college, well you had a whole day to enjoy right. Growing up, this was the scene every Sunday. Though I am realistic enough not to expect this now, whenever I make poori chana, I remember my own childhood days and get nostalgic. Which by the way is every week! Sometimes I almost wonder if we only live in our past, the memories that made it all so colorful, wanting to savour those moments again, without a care in the world on thoughts on who gets to do the next thing down. My parents have never been strict and let me enjoy every bit of whatever was happening. When I try to be little strict with my kids, hubby dear stops me, saying they should enjoy without us going up their throat, every other second. Well I point out that our parents never preached much, yet they were role models for us to learn. The current generation never seems to understand even after being told. But then maybe that is how it has to be. Anyway the thought of channa masala seems to have evoked lot of thoughts. With kids being at home the last two days, because of rains, they exams have been postponed. So being at home they naturally want different breakfast than Dosa or idlis. And pooris reserved for a Sunday gets made. And what better than enjoying those with Channa masala. I have so many channa masala recipes, that yet another one was just fine. Makes it easy to have so many to choose from. This version is even more creamier and kids loved it so much. So for K, it is Kabuli Channa Masala! Incidentally this was first made with Aloo Batura and it was a great combo as well. 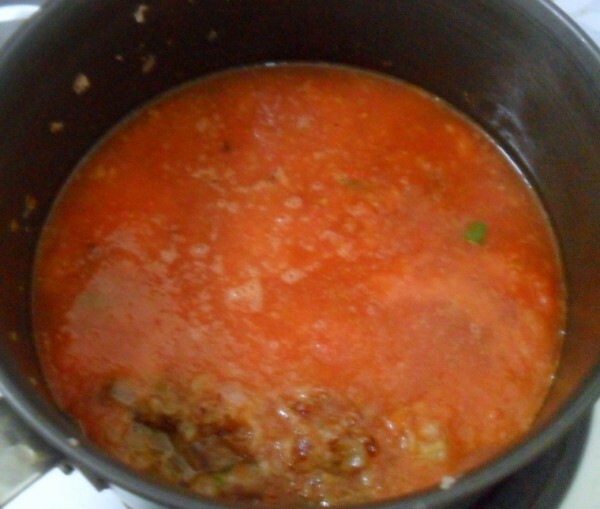 For garnishing finely chopped Fresh onions, Fresh tomatoes and a dash of lemon juice. Wash and soak the channa overnight. Change waters and pressure cook till soft. Drain over a colander, remove 2 tbsp of boiled channa aside. 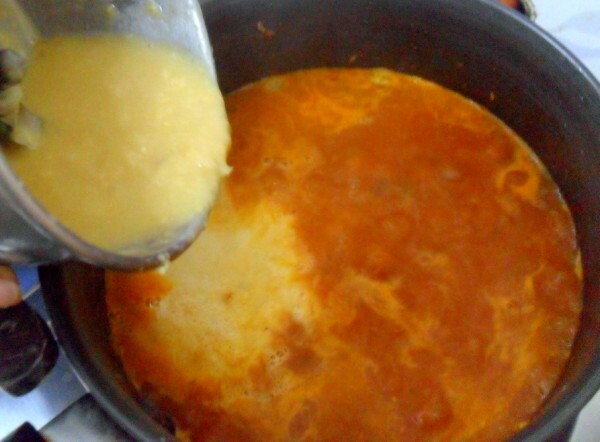 Puree this to a smooth paste to be added to the gravy for thickening. 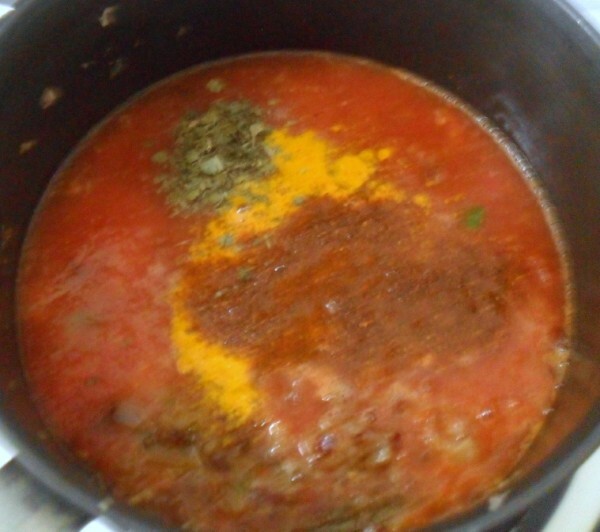 Mark the tomatoes and soak in hot water for 10 mins. Peel off the skin and make puree. 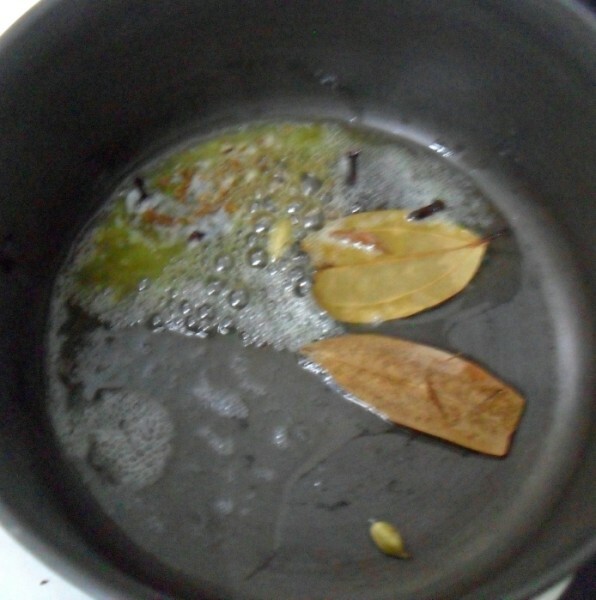 In a non stick pan, take the butter, oil, add cumin seeds, bay leaf, cinnamon, clove and cardamom. 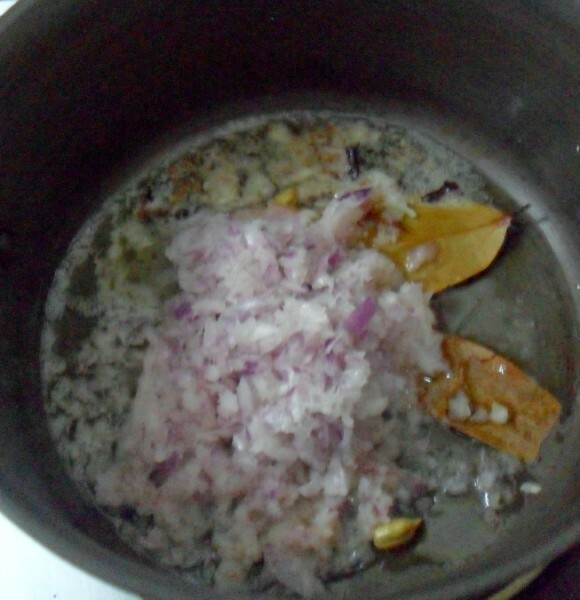 When they start to crack, simmer and add the minced onions. 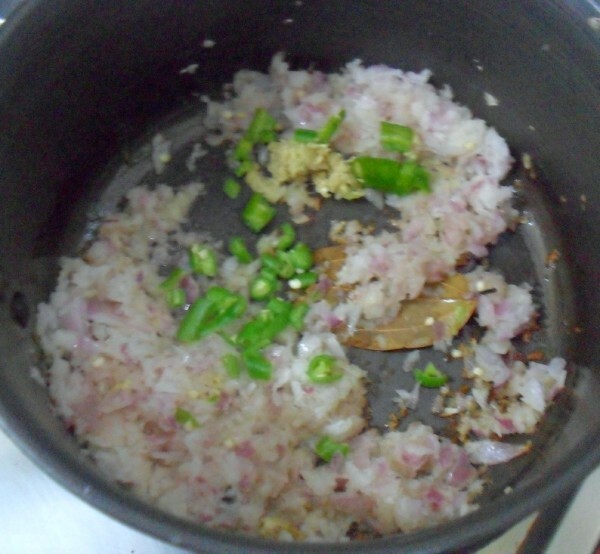 Add the slit green chilies, grated ginger along with onions, and fry over medium heat till the onions turn colour. Add salt to fasten the browning. 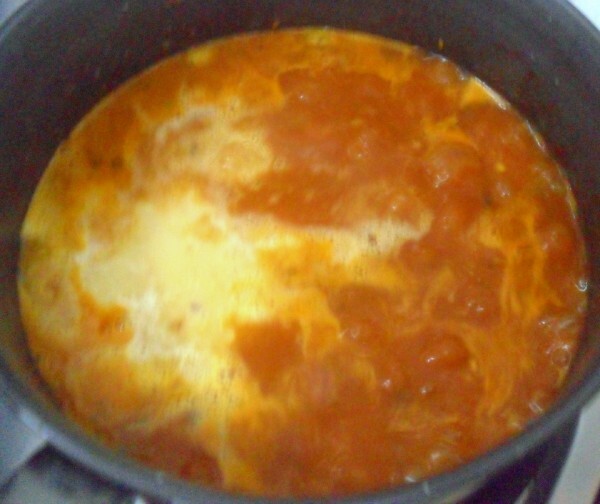 Now add the tomato puree, cook on low flame with a lid (as they splutter). Keep stirring. It might take a while. After 10 minutes, add Garam Masala powder, turmeric powder. Add dried mint powder. Then boil for a while. When the oil starts to come out on the sides, which takes about 10 mins, the masala is ready. Add the drained chickpeas, let it blend well. 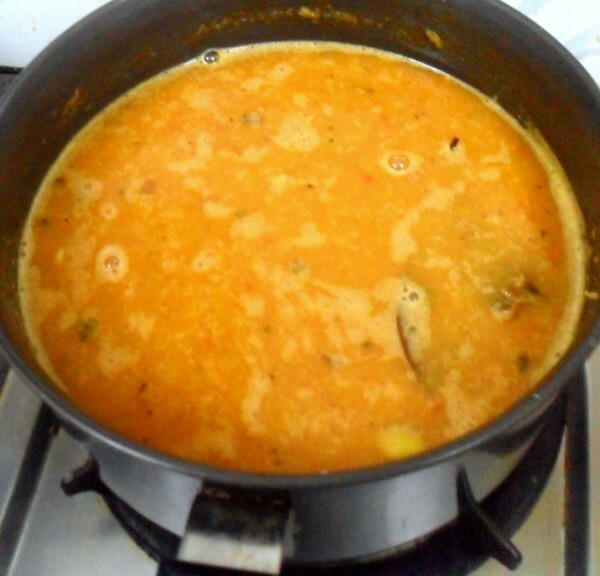 Then add the ground chickpea puree and adjust the consistency by adding drained water. Let it boil for 2 minutes. Simmer and add milk and cream. Mix well. Switch off the stove after a minute. Garnish with fresh chopped coriander. Just before serving, garnish with freshly chopped onion, finely chopped tomatoes with a dash of lemon juice squeezed on top . 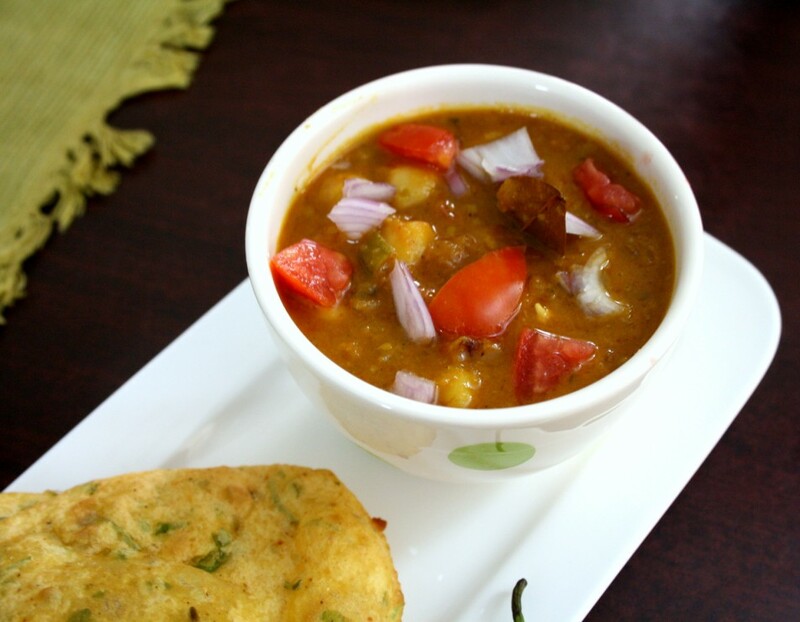 Who would say no to this yummy dish I love it with puri it's my all time fav one. thats an super yummy and delicious channa masala wud love to have them with bhaturas 🙂 looks so yummy am drooling here dear !! What a yummy looking chana masala. I think chana masala is one of those dishes that one can have tons of recipes, but there still might be many many more. Addition of milk is new for me. It must be making all the spices a bit mellow. Must try next time I do Chana masala. Rangoli on Sunday mornings seem to be a part of growing up for everyone! Well, there was nothing to worry about at that stage except may be the poori getting over fried!! samosa and even puffs.There is a Keralite bakery near my house and his chana is simply delicious. The pictures are all very nice and your writeup at the beginning has embellished the post. I was thinking that you would made something with chana by seeing falafel on that day. Chana masala looks so delicious , perfectly made with flavors and aromatics. Delicious looking chana masala, looks so yummy. A fantastic masala, just goes awesome as side dish with anything, am in love with ur green polka dot bowl. 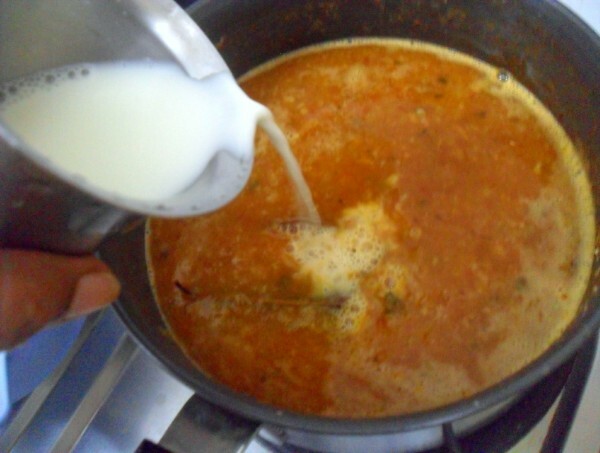 Never cooked chana masala with milk. Sounds interesting. Chana Masala with milk? That is new!! BTW, is Rangoli still telecast on sundays? I remember how we used to look forward to it! 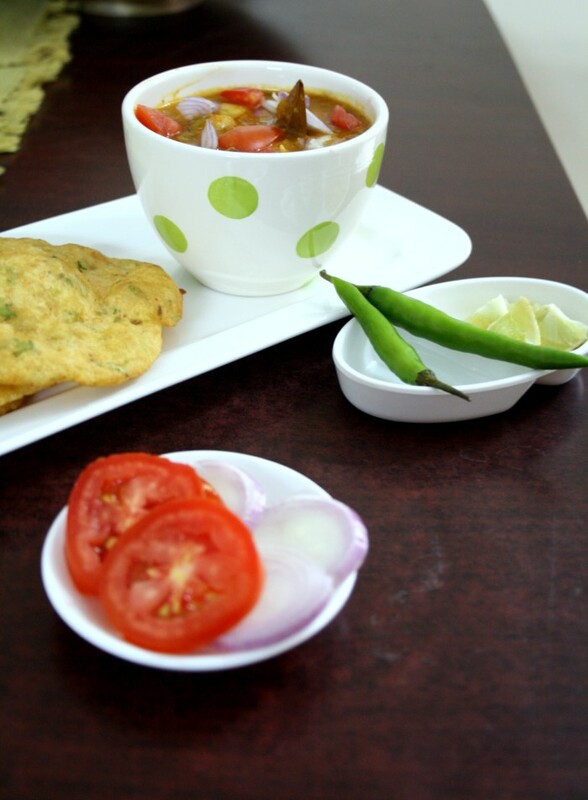 And this recipe with poori makes me hungry right now-Breakfast time! 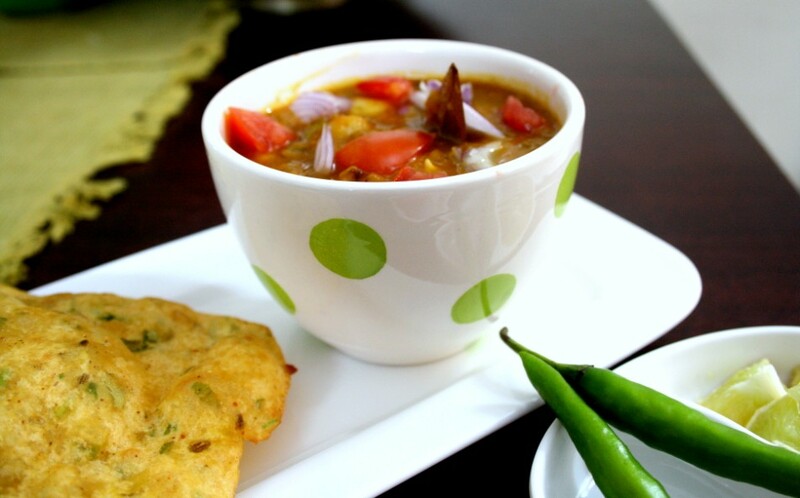 My all time favorite sid dish with puro or naan mouthwatering. But milk!!!! interisting Valli. I love this combo and your write up is so interesting. Took me back to my childhood days..
you have a great talent of writing.. very well written post!! looks awesome!! Yummy curry.. My favorite dish & I would never say no to this curry..
Just spells comfort food for me – so many diff varieties of channa / chole right ? As for Rangoli, as kids we had to be satisfied with the songs from the neighbours' TV : no film based programs were allowed at home :-)) strange but true.. Comfort food that is chana masala. Loved Rangoli I used to get up early to watch the songs. Ahhh! that was life.